Prevents the formation of crow's feet. Fights dark circles and puffiness. 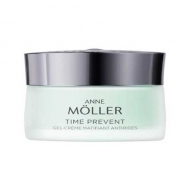 DESCRIPTION: Time Prevent Yeux Roll-On from Anne Möller is a treatment for the eye contour that prevents the formation of crow's feet and dark circles and puffiness fights. Its formula with the merger of two active ingredients, Blocage DNA Systeme * and ** RADIANCE COMPLEXE, optimizes the recovery of DNA damage, favors cellular detoxification and strengthens the natural protection against external aggressions. The lifting effect acts on chicken feet and dark circles, improving elasticity. 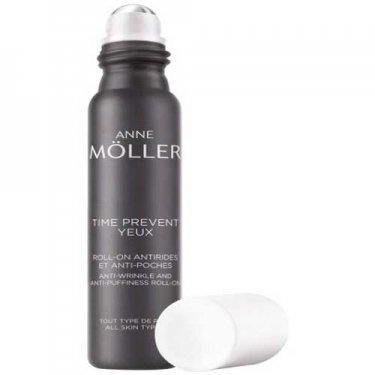 Its roll-on applicator decongest and comforts immediately. The texture is gel, light, refreshing and non-greasy. To optimize the decongestant effect can be stored in the refrigerator.